Motorcycle Paintings. Motorcycle Artist, A.D. Cook. It’s only natural for me to create motorcycle paintings. Like the saying goes, “I was born to ride“. My earliest memories of motorcycles were riding with my dad when I was only three or four years old. He would sit me in front of him on his big ‘ol Harley and I would hold on to the sides of the gas tank as he drove. I loved the sound and the feeling of flying as we rolled down the street. Although I’m sure we didn’t ride far, it was far enough for me to know I loved it. It was like nothing else. And dad – he was cool in his dark brown bomber jacket, white t-shirt and engineer boots. He was my hero and I was hooked on the whole motorcycle experience. I guess you say was born into it. Over the years I’ve owned a lot of motorcycles – mostly Harley-Davidson baggers and Softails, along with a few other bikes. There a few years when I was younger that my motorcycle was my only means of getting around. I never minded that because I loved riding. After all, bikes are cool. When I was 17 I bought my first bike from a friend. At 18 I strapped everything I owned to the back of my burgundy red Honda 400 Four Super Sport and moved from Oregon to Arizona – a 1400 mile ride in just two-and-a-half days. Since then, I’ve logged tens of thousands of miles straddled upon my iron horse of one brand or another. So, as a rider and enthusiast, painting iconic motorcycle art is only natural for me, and I’ve been painting my passion for years. With that, I share a sampling of my motorcycle paintings with you here. AMERICA, my latest creation as a motorcycle artist was a real journey for me, in a lot of ways really, and truly has a great story to share. My collector, “E.J.” of Destination Harley-Davidson fame commissioned my latest painting on canvas. He had a collectable replica chopper from the classic movie Easyriders, starring Peter Fonda and Dennis Hopper, on his showroom floor for years. But alas, like all good things, that too, came to an end as he put the bike up for sale. That’s where I came into the story. I’ve know E.J for a long time and he has a few of my favorite motorcycle paintings adorning the walls of his beautiful home in Tacoma, Washington. So, when E’J called, it didn’t take long for me to decide to fly up to visit him and photograph his bike before it was long gone. I really enjoyed scouting a fun location for my shoot, and we ultimately decided roll her onto the pier and shoot her in all her glory. But that was just the beginning. I took over 700 photos of that bike over the two days I visited E.J. and his family. It seems like a lot but the bike inspired my so I wanted to explore all my creative options with her. Inspire the rider within with “AMERICA”, my newest epic motorcycle artwork. 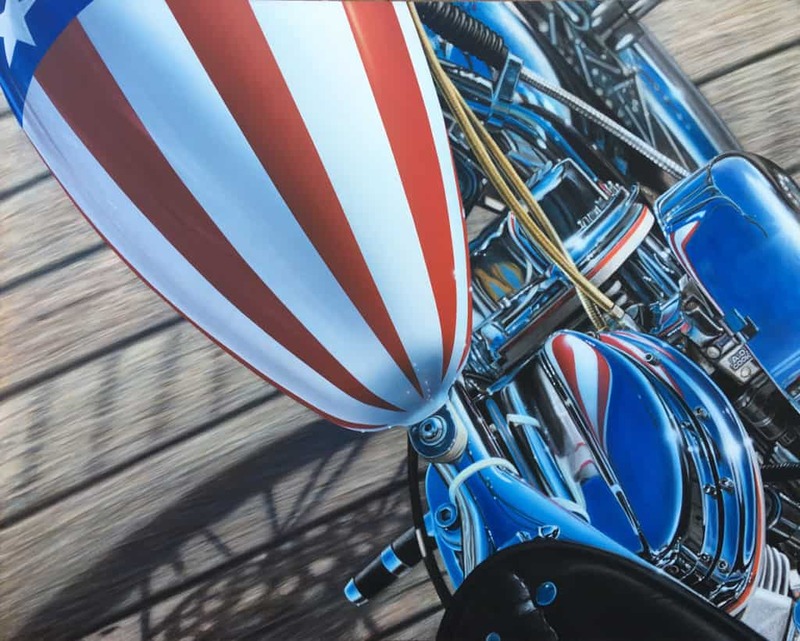 Driven by desire for freedom and the open road, this super-sized painting showcases American pride and craftsmanship. AMERICA is the first from my new series AMERICA FIRST, which will showcase American motorcycles realistically painted in a patriotic theme. It started in October on a beautiful Indian Summer’s day. In Oregon, those kind of days are rare – especially for autumn. So, I called my buddies at Indian Motorcycle of Portland and asked them if they had a bike I could borrow for the afternoon. They were kind enough to offer me anything on the floor, and a hot red Indian Chief caught my eye. I had been wanting to take one of those out for a spin for quite a while, and the day and the opportunity where perfect. After loading camera and equipment in the saddlebags, the Chief and I made our way to a cool Portland park with a pristine lake. So after shooting a couple good rolls of film, I had reference material for Indian Summer – the fifth painting from my motorcycle series. 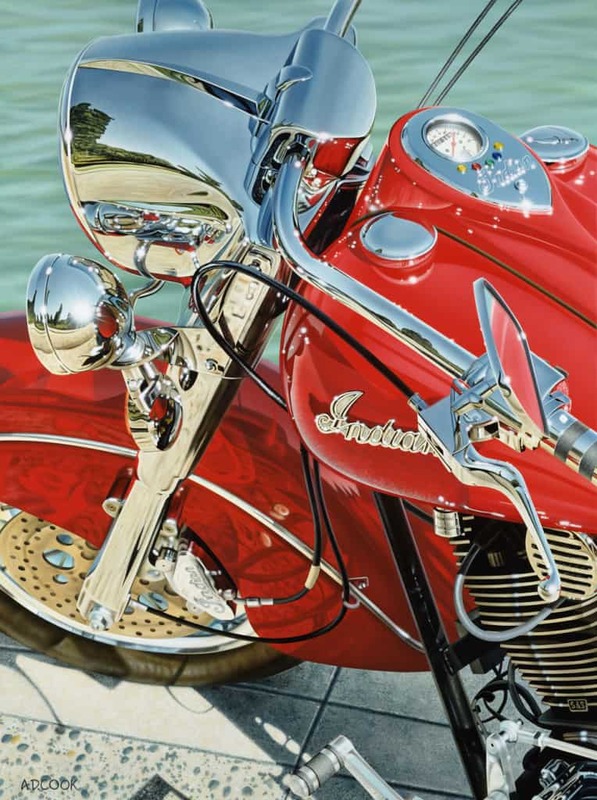 INDIAN SUMMER is my most recognized painting from my motorcycle series, having appeared on the cover of Airbrush Action magazine, April 2001, for my article “A Study in Chrome and Reflected Surfaces”, which can be read on this site (click here). Art Imitating Art. A.D. Cook paints pictures of Harleys and man does he ever. “Passing Time” is his latest piece, and it’s a fine one. No question about it, either, the guy knows how to lay down an airbrush acrylic image on canvas. “Course, he has been doing this for over 20 years, so the flow should be dialed in by now. A.D. Cook’s work can be seen at www.adcook.com, if you wanna adorn your walls thusly. As seen in Easyriders, Quick Throttle, Airbrush Action Magazine, The Ultimate Airbrush Handbook and numerous other publications. Featured motorcycle paintings: America, Indian Summer, Passing Time, For Show, Autumn Riders, Duet.